This was the most unusual sunset I've ever seen. Right after this photograph was taken, the Sun disappeared behind the mountain. But not even a minute later, it reappeared on the left-hand side of the mountain's peak for a brief moment. Finally it sunk from the sky altogether. Antarctica is a strange land. Petermann Island was the farthest point south that I traveled. By the time you get to the South Pole (which I was not close to), there is essentially just one day and one night that take one full year to happen -- half the year is day then the next half is night. I don't recall at what latitude it started, but for a big chunk of my voyage, it never really got dark. 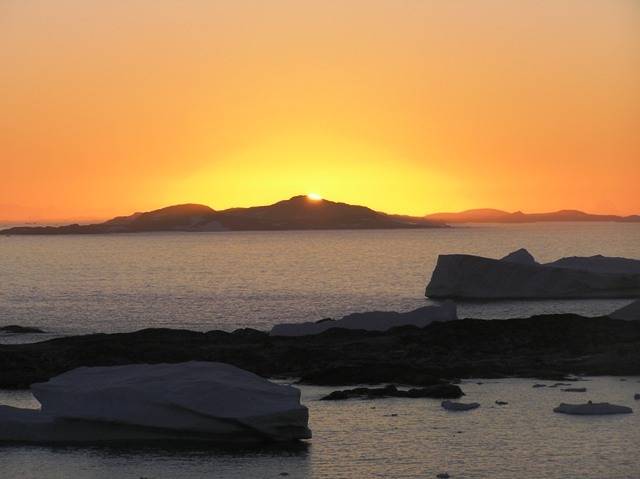 Although sunset for Petermann Island was officially 10:54 PM, the nights were bathed in perpetual twilight. As for why the Sun behaved so mischievously, it has do with how Earth is tilted and the position of Antarctica on the globe.